Champion of a new State through public schools, canals, roads, 1777-1832. Grave 50 yards west. 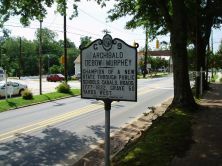 Archibald Debow Murphey, attorney, jurist, legislator, and internal improvements advocate, was born in the Red House community in Orange (what is now Caswell) County about 1777. One of seven children of Archibald and Jane Debow Murphey, he was educated at David Caldwell’s classical academy in Guilford County before attending the University of North Carolina. He was licensed to practice law, having studied under William Duffy in Hillsborough in 1801. Murphey then purchased his father-in-law’s home near Hawfields in Alamance County and established a large plantation that included grist and saw mills and a distillery. By 1807 he had purchased Lenox Castle, also known as Rockingham Springs, a sulphur springs resort in Rockingham County. Investments such as the resort would leave Murphey impoverished later in life. In 1829 he spent twenty days in debtor’s prison. Murphey’s contributions to North Carolina place him in a category by himself. Elected to the state senate from Orange County in 1812, he sought to awaken North Carolinians to knowledge of the state’s resources and possibilities. His comprehensive plan for the state urged the establishment of a public education system, construction of canals and turnpike roads, as well as a general public welfare system. Although most of his projects did not come to fruition during his lifetime, many served as models for the next generation. 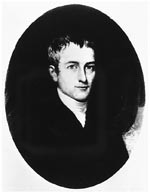 Murphey served as a Superior Court judge, 1818-1820, and briefly taught at the University of North Carolina. He planned but never completed a history of the state. 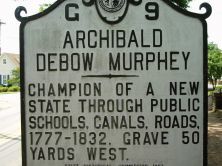 Archibald Debow Murphey married Jane Armistead Scott in 1801. The couple had five children live to adulthood. Murphey died on February 1, 1832, and was buried at the Presbyterian Church in Hillsborough.